This is a really nice pin, Cynthia. Your metal work is gorgeous! Do you also sell handmade shawl pin in Rosewood, mango wood, sheesham wood. I assure these will sell very well at knitting shows. Specially the heart shaped designed that we have launched in various variants for valentine's day. Also let us know how can we buy these copper shawl pins ? I sell only the things I make myself so I am not interested in purchasing from others. 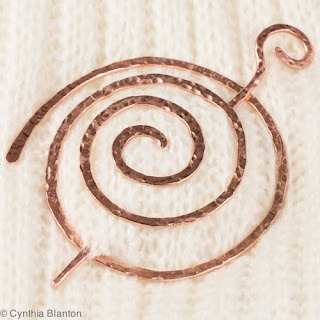 I make the copper shawl pins myself and do not wholesale them. Thank you for your message. Every Young ladies , Womens & Girl are Found of Shopping .